Home > Tables > Banquet Tables > Lifetime Tables > Lifetime 80583 White Granite Commercial 72 12-pack of tables and 120 chairs. 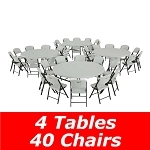 Lifetime Tables and Chairs - 80583 12 72 inch Round Tables 120 Folding Chairs. The 80583 is great for all kinds of events. The table tops are UV protected to prevent cracking, chipping, or peeling. The round design allows for easy rolling to your desired location. Great for commercial or Residential Use. 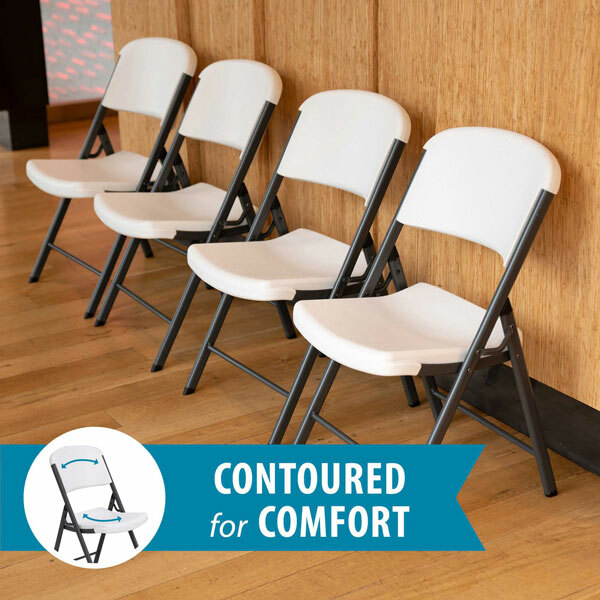 The Chairs are molded for maximum comfort and support. 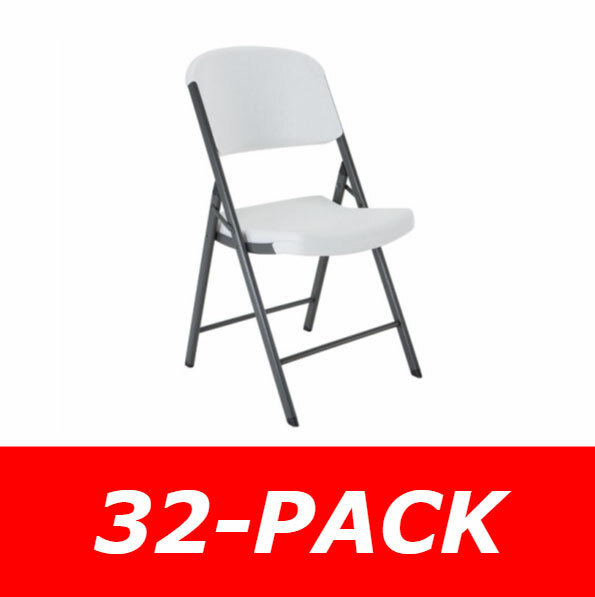 Comfortably seat 120 people with this package of 12 72 inch round folding tables and 120 folding chairs from Lifetime Products. These tables are the same model as the 2673 Lifetime Round Tables. 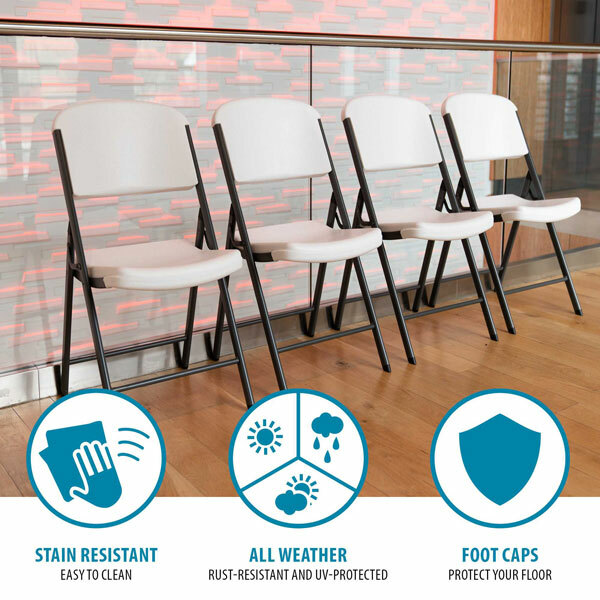 The chairs are the same model as the 2802 Lifetime Folding Chairs. 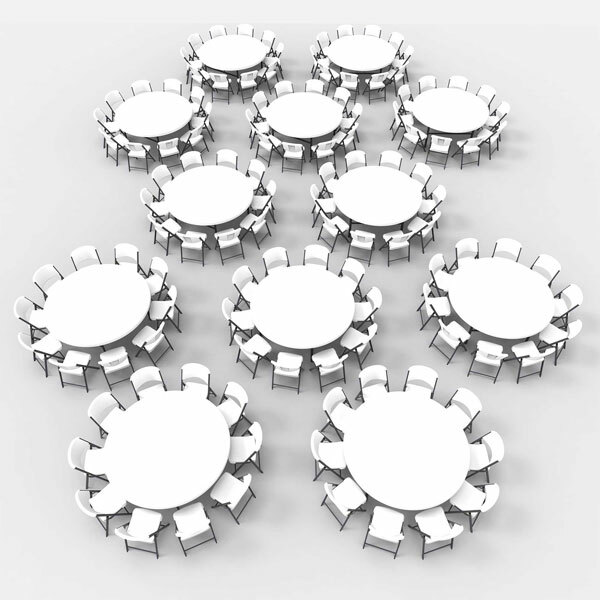 Each 72 inch round table comfortably seats 10 people. 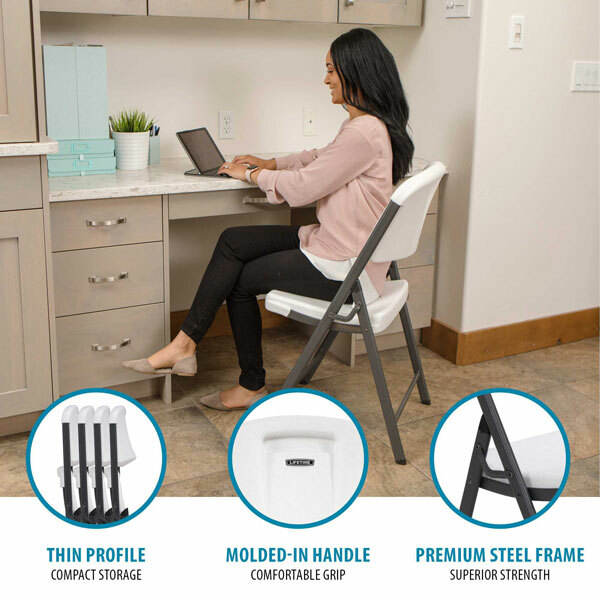 The table top, chair seats, and chair backs are all made of high density polyethylene plastic. This plastic will not fade, crack, or peel and is suitable for both indoor and outdoor use. The frames of the round tables and folding chairs are made of powder-coated steel, which is rust resistant. Order your Lifetime tables and chairs here. 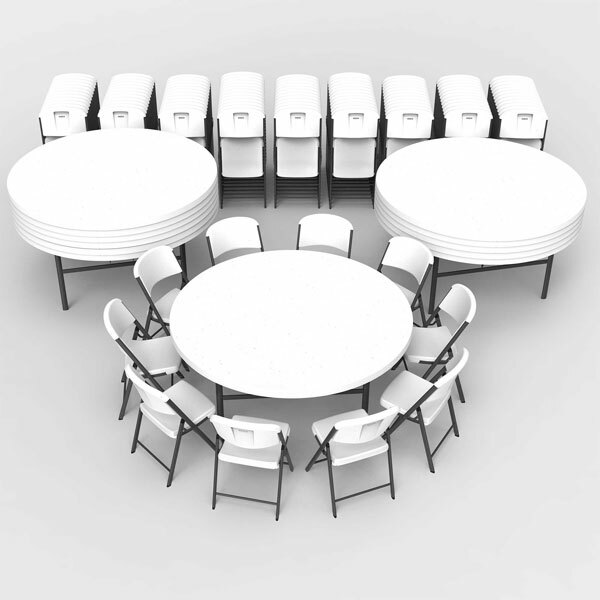 The Lifetime 60 inch Round Table and Chair Combo Features 12 of 2673 (72" round commercial tables), (6) 42804 commercial folding chairs - 24 chairs, and (96) commercial folding chairs (2802). 10-year limited warranty. This package comes with 12 folding tables. Q: What is the warranty on this package? A: These items have a 10 year warranty through the manufacturer. We email you a receipt immediately following your order and we keep a copy for your warranty records should you lose it. These tables are fantastic and there are very few warranty claims for that reason. 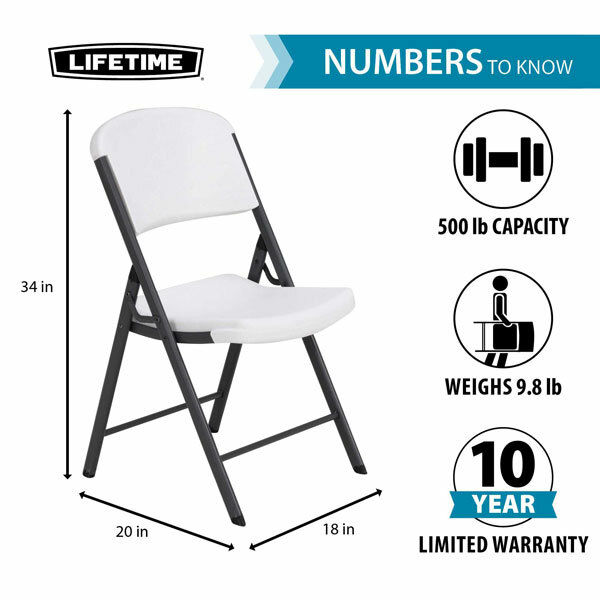 Shipping: Orders for the 80583 Lifetime Table and Chair Combo generally leave the warehouse within 1-3 business days. Delivery varies by location but typically takes between 2-5 business days. Call for more exact estimates.